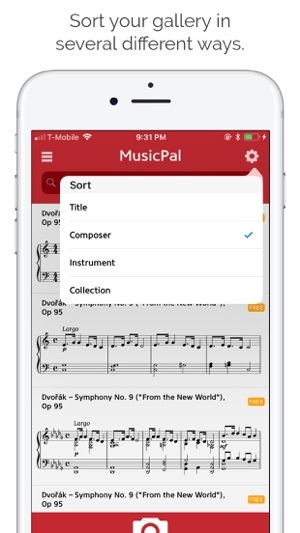 MusicPal’s newest feature is our growing library of compositions that are ready for you to listen to, to play or sing, and to interact with. Several compositions are free, more are available through subscription. 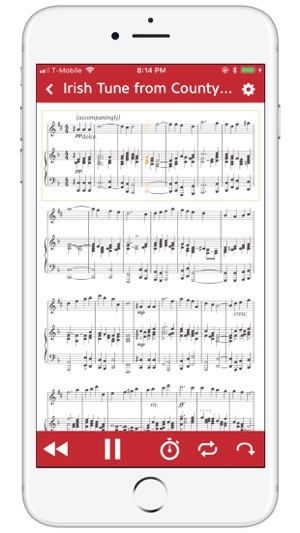 In addition, you can still snap a photo of your own sheet music and MusicPal will play it for you. Listen to the full page or note by note, loop phrases, even isolate the treble or bass clef. We welcome your participation and suggestions. Enjoy! • Select a composition from our growing library, and play along instantly, interacting with the musical score. 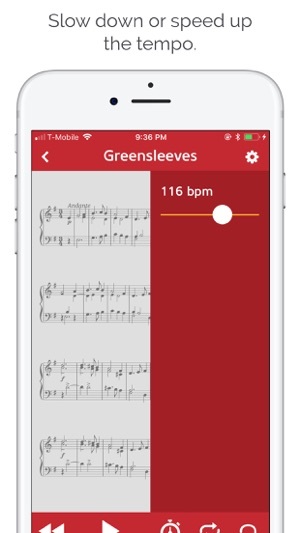 • Or take a picture of a page of music and MusicPal will process the photo, enabling you to hear what you see. • Tap music clefs to mute and unmute staves: hear the right hand part while playing the left hand part, and vice versa. • Press play to hear and follow along with the music. • Tap to hear any note or chord. • Tap and drag to listen to a selection. • Pinch to zoom in and out. 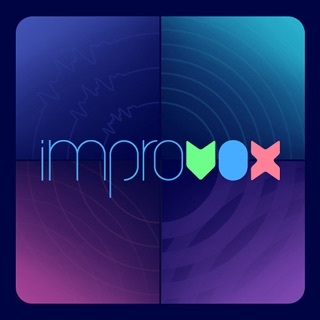 • Change playback tempo and transposition level. • Use the toolbar buttons to loop a passage, or go note by note. Photos are supported for keyboard music (two staves) and monophonic instrumental music (one staff). Successful photo results depend on the quality, completeness, and simplicity of the musical score image. 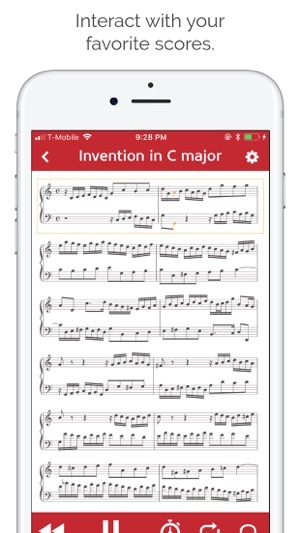 MusicPal is designed to take pictures of conventional Western sheet music notation that is printed on paper. 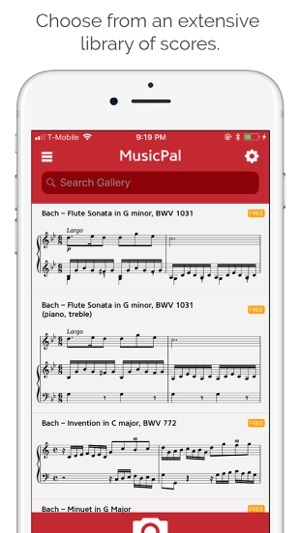 MusicPal will not properly photograph guitar tab, handwritten music, vocal music with lyrics, music with specialized notations, or sheet music displayed on laptop and mobile screens. Payment will be charged to your iTunes Account at confirmation of purchase. Your monthly subscription automatically renews unless auto-renew is turned off at least 24-hours before the end of the current period. Your account will be charged for renewal within 24-hours prior to the end of the current period, and identify the cost of the renewal. Subscriptions may be managed by tapping the Manage Subscription button and auto-renewal may be turned off by going to your account settings after purchase. Any unused portion of a free trial period, if offered, will be forfeited when the user purchases a subscription to that publication, where applicable. We have improved the user experience by updating the navigation flow. There is now a 'Send Feedback' option available from both the tab bar and from the 'More' tab. Take a minute to send us feedback so that we can continue to improve your experience! In addition to the user experience, we have added new content that is included with your monthly subscription. Visit the 'Subscription Page' for more information. This app is incredible and it works very well when you have the right lighting. The matching game is also very fun and it helps the app get better, which is always a plus. The music features are outstanding. This app needs to get more love because it is very good. © 2018 Robert Taub. All rights reserved.